Flour House in San Luis Obispo elevates pizza from mere crust, sauce, and toppings to the art form known as Napoletana pizza. Stop by this restaurant and taste for yourself why this pizza is the national treasure of Naples, and enjoy a side dish of its Italian history and culture. 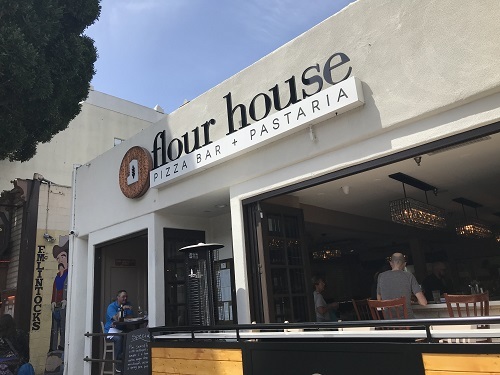 Tucked into downtown San Luis Obispo along Higuera Street, Flour House takes the ordinary ingredient of flour and, through the alchemy of knowledge and spirit, creates a pizza that is delicious and unique while it honors culture and history. Because at Flour House, pizza is much more than pizza. As you walk into the modern yet inviting dining room, just past the cozy seating area with calming white tile walls, you see it. The Stefano Ferrara wood-fired oven. An open seating area with a view into the heart of downtown San Luis Obispo. Standing taller than the specially trained Pizzaioli staff bustling in the open prep area, this is no everyday pizza oven. For nearly 100 years, the same family in Naples has hand-crafted each oven from hand-pressed bricks. The oven floor is formed from clay from the Sorrento coast. Designed to bake the hand-formed pizzas at 1,000 degrees F, this oven is key to creating Napoletana pizza. In just a couple minutes, out comes your pizza. And it’s not the ubiquitous red-sauce-cheese-and-pepperoni pizza you may have expected. This—soft, foldable, pillowy crust, with a blistered bottom, and topped with imported Italian tomato sauce and cheese—is Napoletana pizza. And it’s the only authentic Napoletana pizza between Los Angeles and San Francisco. It’s a long way from Naples to San Luis Obispo, so how did owners Alberto and Gessica Russo bring traditional Napoletana pizza here? Gessica and Alberto Russo in Ravello, Italy. Gessica, who grew up in San Luis Obispo, has family in southern Italy and was teaching English classes in Salerno. Alberto, a Salerno native, had earned degrees in chemistry and food packaging and was working with a packaging company. He knew his career would be even stronger with more proficiency in English, so he took a language class. Gessica was his teacher. They dated, and then got married in Ravello, Italy. Around the same time, Gessica’s parents, Giuseppe and Debra Silvestre, were starting to consider retirement from Vieni Vai Trattoria, the downtown San Luis Obispo restaurant they had owned and operated since 1998. Gessica and Alberto decided to move to SLO and run Vieni Vai for two years during her parent’s transition to retirement. When her parents offered them the opportunity to rent the building, they jumped at the chance. 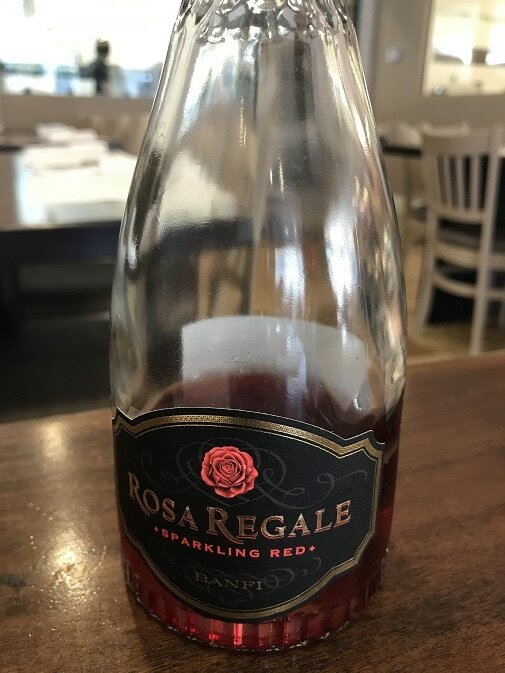 They also knew they wanted to change the concept to their vision: a local restaurant that features the authentic foods from their Naples roots with a focus on the traditional Napoletana pizza, combined with the desire to innovate. After five months to completely renovate the interior, Flour House opened in June 2016. “We also want Flour House to share the feeling of Campania, Salerno, the Amalfi Coast—light, bright and open,” said Alberto. The name Flour House was chosen as intentionally as the new décor. “We purposely gave our restaurant an English name rather than an Italian one,” said Alberto. “While our families are from the Campania area, we wanted to reflect that flour is an international ingredient and the foundation for a wide range of creative foods.” As he explained, flour can be made from more than wheat, and it can be used in more than bread. In June 2016, Flour House opened its doors and began creating authentic Napoletana pizza in San Luis Obispo. 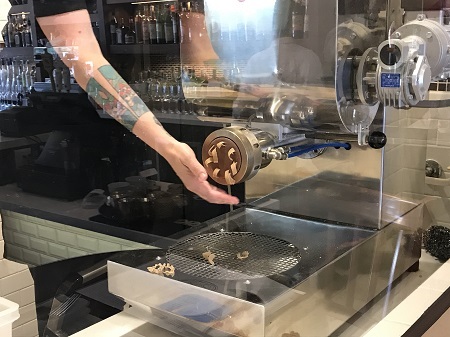 So Flour House is more than exceptional pizza and pasta made on the in-house machine; its focus is on a great overall experience. 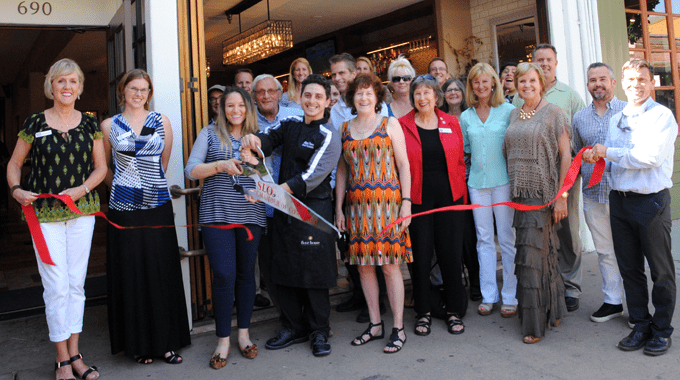 “We want people to know us through the food we share and the service we provide,” said Gessica. Napoletana pizza: its trademark pillowy crust is part of its historic and cultural appeal. The Russos wanted to bring Napoletana pizza here for two reasons: it’s not common, and it’s an integral part of their families and heritage. In Italy, pizza is the centerpiece of a social meal instead of getting a cardboard box on the way home. “It’s a time to get together with friends and family, relax with a glass of wine or a drink with dinner, and take time to enjoy it all,” said Gessica. True Napoletana pizza is so revered in Italy that its creation is protected by law, and it must be made only with certain ingredients. And becoming a true Pizzaioli (Napoletana pizza maker) is earned through a licensing process. Flour House upholds these traditional criteria, first by importing the Stefano Ferrara oven and using traditional ingredients. “We use the same ingredients as those used in Naples, such as imported ‘double zero’ Italian flour and sauce from San Marzano tomatoes from the Campania area,” said Alberto. These tomatoes and other traditional products are designated DOP—Denominazione di Origine Protetta—which certifies they are locally grown and packaged according to traditional quality methods. Italian and French wines have similar designations (DOC and DOCG for Italian, and AOC and Cru for French). They also let the dough rise for 24 hours before it’s baked, compared to a more typical shorter rising time, which allows the pizza to be baked the same day. With the San Marzano tomato base, you can choose from nearly a dozen carefully crafted combinations, such as Siciliana, with sautéed eggplant, parmigiano Reggiano, fior di latte, and basil. 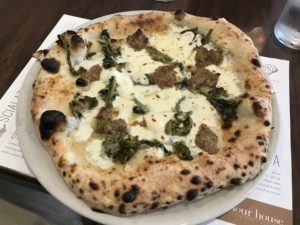 Flour House also has a few white pizza variations, like its Vesuvio, with broccoli rapini, fennel sausage, and pecorino. Flour House creates its own house-made pasta. While Flour House is about traditional Napoletana pizza, that’s just the beginning. “We believe in staying fresh and innovating,” said Alberto. “Alongside our traditional pizza and house-made pasta, we offer Signature Pizzas that are a bit different.” One is the Norcina, with porcini mushroom sauce, guanciale, fontina, flor di latte, and black truffle cheese. Alberto continues to evolve in his culinary offerings. On Fridays and Saturdays, they offer a special meal, based on what’s fresh and local. “It might be meat, fish, maybe a burger,” he shared. They post the menu on their Instagram feed, and these special dinner items regularly sell out. In addition to entrees, Flour House offers appetizers, soups, salads, and panuozzi—sandwiches made from their pizza dough and baked in the wood-fired oven. 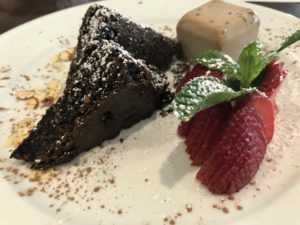 A gluten-free chocolate torte and gelato round out a fine Italian dining experience at Flour House. Other restaurants often use pre-made frozen gluten-free pizza crusts. Flour House uses imported gluten-free flour for its house-made pizza dough and pasta. If you’re curious, just ask Alberto; he’s happy to show you the bag. Like their regular dough, this one rises for 24 hours and results in a light, chewy pizza. Gluten-free diners can experience the taste of a traditional Napoletana pizza instead of the typical crisp, flat, rice-flour crusts found in many other places. While Flour House uses gluten-free ingredients, its facility is not a gluten-free environment. For those without the need to avoid cross-contamination completely, however, Flour House is a delight of gluten-free-friendly options. If you head into Flour House on Monday, you’re lucky. It’s Meter Monday! This isn’t about the parking meters in downtown San Luis Obispo, but about a full meter—nearly 40 inches—of pizza, to share with friends and family. You can also order a ½ meter pizza. Luigi Dell’Amura is credited with this idea—offering different sizes of pizza and a number of toppings based on how many people would be sharing—in the 1930s in Vico Equense Sorrento. Because of the large size of these pizzas, a different mixing process results in a firmer consistency than the Napoletana crust, while still being light. From a dozen available tastings (or toppings), you can choose three for the ½ meter, which serves about 4 people, and six tastings for the full meter pizza, which serves about 8 people. While the Meter Pizza is not available with gluten-free dough, you can get a gluten-free pizza to enjoy along with your friends. The full bar offers a range of Italian and domestic beverages. Flour House has Happy Hour every day from 4:00 – 6:00 pm. The full bar provides everything from classic Italian wines, Negroni and other Italian apertifs, to select local beer and wines on tap. Wednesday is industry night. While they don’t take reservations, you won’t have much of a wait if you stop by around 5:00. Weekend late afternoons are a great time to visit before the dinner crowd arrives. The back patio is quiet and can be reserved for larger private parties, along with different menu options. When’s the last time you got to taste one of Italy’s national treasures? 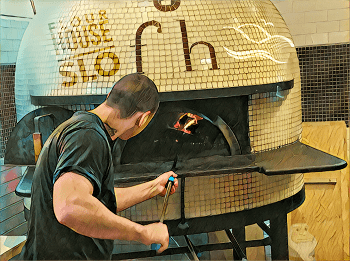 When you walk into Flour House with an open mind and a traveler’s spirit, in just a few minutes, you’ll experience the pizza that is revered in Naples. It won’t be your usual take-out pizza, and that’s a very good thing. True Napoletana pizza must be made with specific imported flour, tomatoes, and cheese from designated suppliers. The dough is made is a specific way, and baked in a wood-fired oven at a temperature of 900 to 1,000 degrees. The result is the signature light, soft, chewy, foldable pizza from Naples. Who doesn’t love pizza? We’d love to hear your comments on our Facebook page!